Pearl Vision set up . 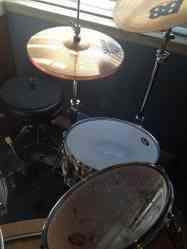 Comes with 5 piece drum set, drumsticks, 2 crash symbols, a ride, tuner and a leather seat. Bought this for a retail price of 1700 dollars not including the 3 symbols and chair. Barely used. WE SELLING DIFERENT CAIN HERBS AND SPICES AT CHERRY IN LONG BEACH CALIFORNIA, WE HAVE GOOD SELECTION OD SMOKE SHOP ACCESORIES. IM SELLING A COMMERCIAL OVEN FOR $20,000. IT IS A ROTO-FLEX OVENS SMOKER NEW MODEL # RS WILL DELIVER IT TO YOU. CALL- 323-228-7231 OR 562-212-8071 ASK FOR NAT.